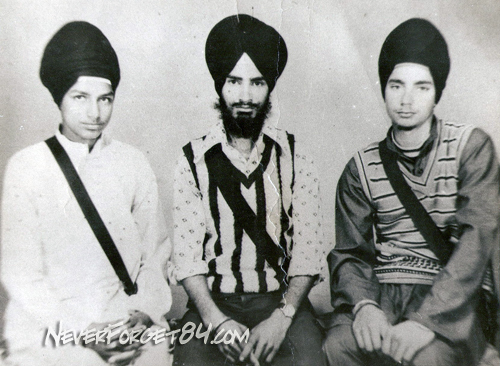 Brother/Sisters : Four brothers: Bhai Joga Singh, Bhai Santokh Singh, Bhai Anokh Singh and Bhai Hardeep Singh. Shaheedi (martyrdom) is the lifeblood of a community. Shaheedi revives dying communities and creates the thirst for freedom. But martyrdom only goes only to blessed souls. A normal person is born, lives life and in the end dies. But a Shaheed chooses his own death and for the sake of his people, abandons a life of pleasure and goes on the path of the gallows. To give a selfless Shaheedi is perhaps the greatest task in the world. Very few warriors vow to become shaheeds, but among these was the brave warrior of the Sikh Kharkoo movement, Bhai Anokh Singh Babbar. His hip was broken and using a bayonet, his eyes were removed. While he was doing simran, Bhai Sahib’s tongue was cut out. Two foot long bars were heated and then hammered from the soles of his feet up to his knees. Heated rods were put through his chest and one was put through his skull. But this brave son of Dashmesh Pita kept doing ardaas that his kesh and Sikhi would remain intact till his final breath. Bhai Sahib’s tongue was cut off using a metal cutting saw. Streams of blood flowed from Bhai Sahib’s mouth but the faithful Singh raised his hands in Ardaas and thanked Waheguru. Seeing Bhai Anokh Singh’s avasthaa of doing simran with every breath, a well known butcher police official SSP Azhar Alam was shocked. In the end, the police became tired of all this and shot Bhai Sahib in the station. When the shot was fired, a motor cycle was started so that the gun could not be heard. Over night, Bhai Sahib’s body was thrown into the river Beas. But the Shaheed’s soul had already, with the power of naam, been liberated from the body. 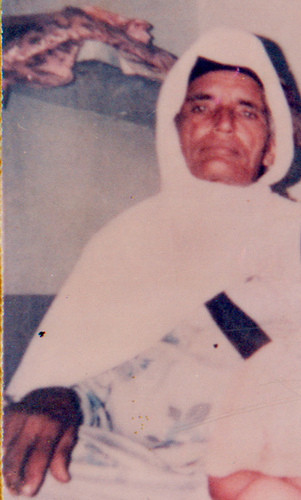 Bhai Anokh Singh Babbar was born in the home of Bapu Makhan Singh and mother Niranjan Kaur in village VaRing Sooba Singh in Amritsar district. 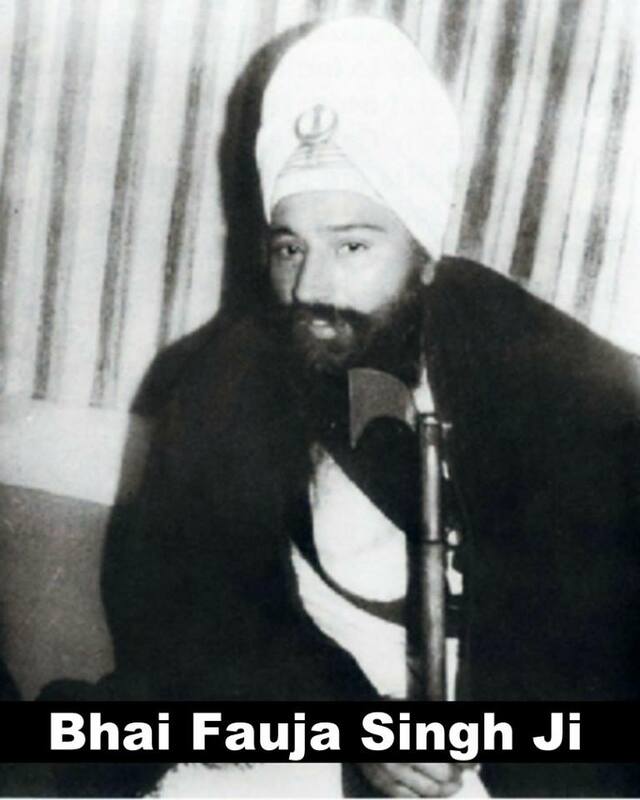 Bhai Sahib was one of four brothers: Bhai Joga Singh, Bhai Santokh Singh, Bhai Anokh Singh and Bhai Hardeep Singh. The entire family was amritdhari and Gursikh. 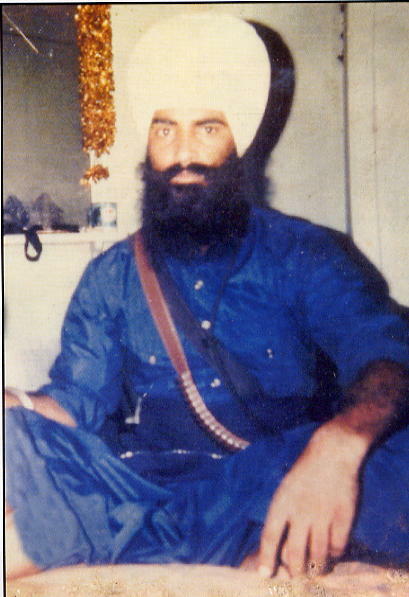 While doing his job, Bhai Anokh Singh came into contact with Bhai Fauja Singh. Bhai Fauja Singh’s personality had a major effect and Bhai Anokh Singh also became a traveller on the Gurmukh path. He used to take training in gatka at Bhai Fauja Singh’s Farmhouse (Khalsa Farm), along with other young Singhs. Bhai Sahib had a deep love for Bhai Sulakhan Singh. Finally, this warrior who welcomed death was arrested while riding his bike by the Jalandhar Police. After bringing him to Vairovaal Police Station (dist. Amritsar), Bhai Sahib was unspeakably tortured. 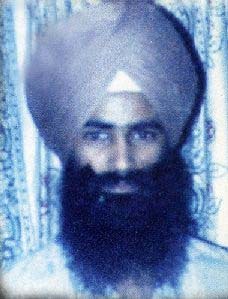 For many days Bhai Sahib was kept hanging upside down in the police station. Foot-long metal rods were heated up and hammered into his legs, from the heels upward. A pin was put through his private parts and an electricity connection was attached to it so that he could be shocked. Hot metal rods were also passed through his chest. But the Guru’s Singh took the tortures calmly. All the torturers heard was “Waheguru”. No cries of pain, no screams. Bhai Sahib was left on the ground, unable to move. The time for Rehraas arrived. Bhai Sahib opened his eyelids but the sockets that held his eyes were hollow. His beautiful beard was soaked in blood. Those eyes which were once lost in deep meditation had been taken out by the dushts. Bhai Sahib called out, “Sentry! Bhai Sahib jee, what time is it?” He felt around himself with his hands to find the guard. And then another atrocity was committed. Bhai Sahib’s tongue was cut off using a metal cutting saw. Streams of blood flowed from Bhai Sahib’s mouth but the faithful Singh raised his hands in Ardaas and thanked Waheguru.